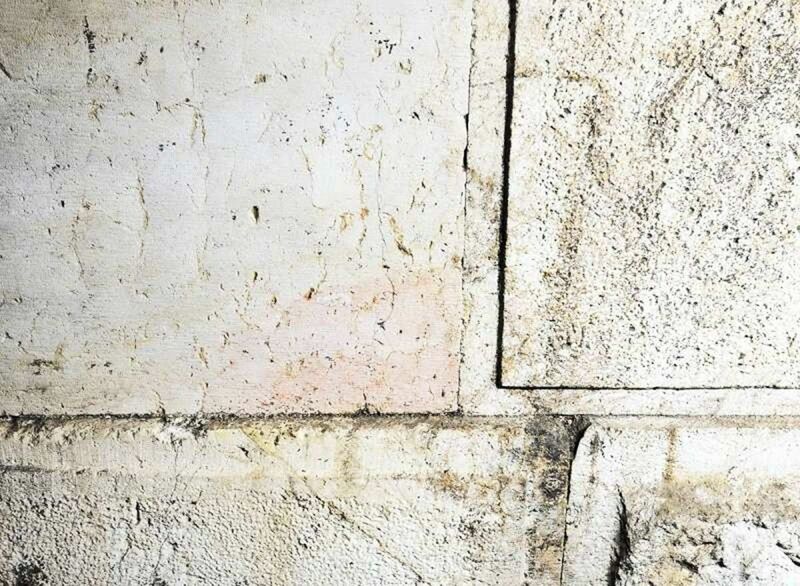 The Antiquities Authority has uncovered some 60 meters of Western Wall foundations, leading to an exciting discovery: One unique smooth stone, unlike any other in the wall • The stone may be left over from the construction of the Second Temple. For centuries, Jews were restricted to praying at the Western Wall, limited to a narrow alleyway near the homes of the Mughrabi Quarter. The history of the alleyway, which was known as Simtat Hakotel (Western Wall Alley), is full of rioting and tears. Pilgrims often described it as a "the pit of hell" where "crowds of Arabs stood above, deriding and mocking the Jews." Jews were prevented from visiting the Western Wall for 19 years (the period of Jordanian rule), but Jerusalem's liberation in 1967 opened a new chapter in its history. Bulldozers removed the Mughrabi Quarter, and the Jews finally had space. Instead of a narrow alleyway of only 90 square meters, there is a large plaza with an area of more than 50,000 square meters, able to hold tens and even hundreds of thousands of people. The third chapter in the Western Wall's history in modern times spreads out over 20 years. In the mid-1980s, the State of Israel finished exposing the entire length of the Western Wall -- 488 meters -- all the way to its northern corner, which is known today as the Western Wall Tunnels. Now begins the fourth chapter, a new era. Very quietly, archaeologists have been expanding their excavations to expose the Western Wall's foundations. At first, the excavations involved only a few meters. 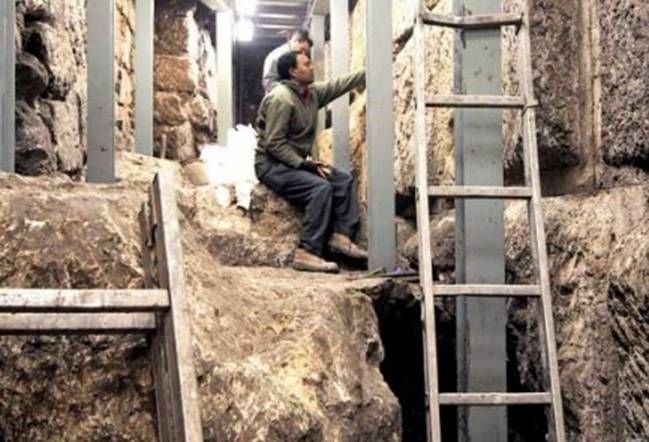 Now, Israel Hayom reports for the first time that roughly 60 meters of the Western Wall's foundations at the southern end, beneath the Jerusalem Archaeological Park (near the Davidson Center), have been exposed. These layers of impressive hewn stone lie upon the bedrock of the Temple Mount at its lowest point (the rock rises as one goes northward). They were hidden, buried beneath the surface of the soil, during the Second Temple era as well, just like the foundations of a building in our own day are buried underground, not visible to the eye. That is also why these stones are of darker hue than the stones of the Western Wall that we know, and it is why even the pilgrims who came to the Temple at festival times never saw them. Archaeologist Eli Shukron reached them in recent years. Until a few months ago, he led the Antiquities Authority's effort to expose the foundations of the Western Wall in the Jerusalem Archaeological Park, an effort that was funded by the Elad non-profit organization. The most important finding that has been revealed so far has to do with the revised dating of the Western Wall's construction. Shukron and his colleague, Professor Ronny Reich (his partner in the City of David excavations), went against prevailing opinion when they determined that the Western Wall had not been built by Herod, but rather by Agrippa I and Agrippa II, Herod's grandson and great-grandson. What led them to this conclusion, which goes against all convention, was the discovery of 17 ancient coins that were minted during the time of Valerius Gratus, who served as procurator of Judea during the years 17 and 18 C.E. The coins were discovered in soil that the Western Wall's builders had used to fill in a mikveh, cisterns and cellars over which the Western Wall was built. When this soil was sifted, the coins from Valerius Gratus' time were discovered -- which meant that the mikveh had been demolished and the first layer of the stones of the Western Wall built on top of it in the year 17 at the earliest, and perhaps even later. Since Herod had begun building the Temple in 22 B.C.E. and died in 4 B.C.E., his heirs, not he, were the ones who began constructing the lower foundations of the Western Wall about 20 years after his death. They, or their descendants, built the upper foundations, including the stairs at Robinson's Arch that led to the Temple Mount from the west, later still. The coins that led the archaeologists to their revolutionary conclusion were found roughly two and a half years ago. Since then, one surprise has followed another and finding has followed finding. The recent discovery is fascinating at the very least: a single stone that is different in appearance from the others and raises quite a few questions. It is completely smooth, lacking the cut margins at the edges that we know well from the other stones of the Western Wall. Where did that stone come from? Why is it there, and why is it different from the stones around it? All the foundation stones of the Western Wall are Herodian stone, also known as ashlar stone, with cut margins and a raised center, called a boss. Even though Herod's stonemasons finished these stones rather coarsely, these stones still bear a close resemblance to the familiar stones of the Western Wall, the ones that are above ground. Of all the stone blocks used to build the Western Wall, only this one is completely smooth, lacking recessed margins and a raised boss. Eli Shukron explains it with an interesting theory. "This stone came from the Temple Mount, from the surplus stones that were used in the construction of the Temple itself. Those stones were high-quality, chiseled and smooth, like this unusual one, which was discovered among the Western Wall's foundations. This stone was intended for the Second Temple, and stones like it were used to build the Temple -- but it was left unused. The builders of the Western Wall brought it down here because it was no longer needed up above -- and this is how the other stones of the Temple looked," he says, adding, "Anyone who passes a hand gently over this stone feels a slightly wavy texture, just like the Talmud describes." Shukron presented his theory at an informal meeting of leading archaeologists in Jerusalem that takes place every month or two. Most of the archaeologists did not rule out the possibility that Shukron might be correct, but there is no solid proof. Dr. Eilat Mazar recently completed the project of documenting the walls of the Temple Mount, which took three years (and was sponsored by the Shalem Center). As part of the project, every single of the walls of the Temple Mount was photographed, researched and numbered. Dr. Mazar confirms Eli Shukron's statements. "Yes -- there is not even one other smooth stone like it among all the stones of the Temple Mount walls. All of them have chiseled margins," she says. Still, Mazar says, "It is hard to construct a theory on the basis of a single stone. If another stone or two like it should be found in the future -- and that could happen -- that will be a somewhat stronger basis for Shukron's theory that the stone came from a surplus that had been intended for the Temple of the type that had been used to build it." Meanwhile, Mazar says, "This is a worthy and interesting idea, but we need to be cautious." The last time a stone from the Western Wall caused such excitement was many years ago, when archaeologist Dan Bahat exposed the layer of stones known as the Master Course in the Western Wall's northern section, which runs along the route of the Western Wall Tunnels. The Great Course's purpose was apparently to stabilize, with its great weight, the courses beneath it. The first stone of the Great Course, going toward the south, is the largest stone in the Western Wall: a 570-ton stone 13.6 meters long, an estimated 3.5 to 4.6 meters wide and 3.3 meters high. Herod's engineers and builders, who constructed the entire length of the Temple Mount's Western Wall, did not place one course on another in a smooth, straight line. Instead, they used a special method in which each layer was moved back about two centimeters from the one below it. The purpose of this method was to provide stability to the structure and give it an impressive appearance, especially from a distance. The "smooth stone" that was discovered in the foundations of the Western Wall is similar in size to the other stones of the Western Wall and a great deal smaller than the stones of the Master Course. Unlike many other areas of the Western Wall, a kind of white mortar may be seen in the area of the foundation that has just been exposed. This is another surprising finding, since the prevailing belief until now was that the wall had been "dry-built" -- using no mortar or filler between its stones, which had been placed one on another. The different situation at the foundation shows the possibility that there had been some sort of filler in the layers of the wall above the ground, and that it crumbled and fell away over the years. Anyone who walks along the Western Wall's foundations today will be able to see, for the first time, how the wall crosses the Tyropoeon Valley (Valley of the Cheesemakers), the well-known valley that for many generations has gone through the Old City in Jerusalem, from north to south. The outline of the valley is blurred today from much construction and sediment, but in the past it was a significant topographical feature that separated Mount Zion in the west from Mount Moriah in the north and a branch of the City of David in the south. For many years, until the time of King Hezekiah, the valley was Jerusalem's western border. In the wall's foundation area, one can see where the wall meets the valley line. At this point, the flow from the Tyropoeon stream was diverted into a Herodian-era drainage canal west of the wall (this canal has furnished findings in recent years; see "An accidental aquatic discovery helps uncover ancient Jerusalem," September 7, 2012). Now the outline of the Tyropoeon Valley, as Flavius Josephus describes it in The Jewish Wars, can be seen and sketched out with greater precision. "The city was built on two hills, which are opposite to one another and separated from one another by a valley. ... Of these hills, the one that contains the upper city is much higher, and in length more direct. ... The second hill ... is called Acra. ... Over against it, there is a third hill. ... The Valley of the Cheesemakers, as it was called, and that which we told you before distinguished the hill of the upper city from that of the lower, extended as far as Siloam. ... Because of the steep slopes on both sides, they are impassable from every direction." Two more surprises awaited Shukron's diggers at the base of the foundations. The first is a stone weighing a beka from First Temple times -- a stone that was used to weigh the silver half-shekel and on which the word "beka" was engraved in Canaanite Hebrew script. Weights of this type have already been found in Israel. The beka is mentioned in the Bible as a unit of weight that was used to weigh the half-shekel that was given by those counted in the census as a way to count them. It was also used later on, in the Tabernacle. The second surprise has to do with the Western Wall itself -- or, actually, with its builders: a chisel about 15 centimeters (6 inches) long that was evidently used to carve the stones of the Western Wall. It was found in a pile of rubble at the bottom of the wall. Shukron believes that one of the workers carving the stone dropped it while he was working on scaffolding on an upper foundation of the wall. "It seems that he didn't bother to go down or that he simply forgot about it," Shukron says. Shukron says that the chisel "is definitely from the time of the Western Wall's construction. Pottery and coins that clearly identify the period were found in the same area. While the stones of the wall came from quarries outside the Temple Mount, the finishing touches, including carving, were done at the site." The head of the chisel is broken or crushed from the repeated hammer blows. But the chisel marks made by it or its fellows from that same period can be seen in the hewn stones of the Western Wall's foundations. The graves of two men and two women who may have been members of his family were also located near the coffin. The discovery of the coffin at Tel Shadud is evidence of Egyptian control of the Jezreel Valley in the Late Bronze Age (thirteenth century BCE). During the period when the pharaohs governed the country, Egyptian culture greatly influenced the local Canaanite upper class. Signs of Egyptian influence are occasionally discovered in different regions and this time they were revealed at Tel Shadud and in the special tomb of the wealthy Canaanite. 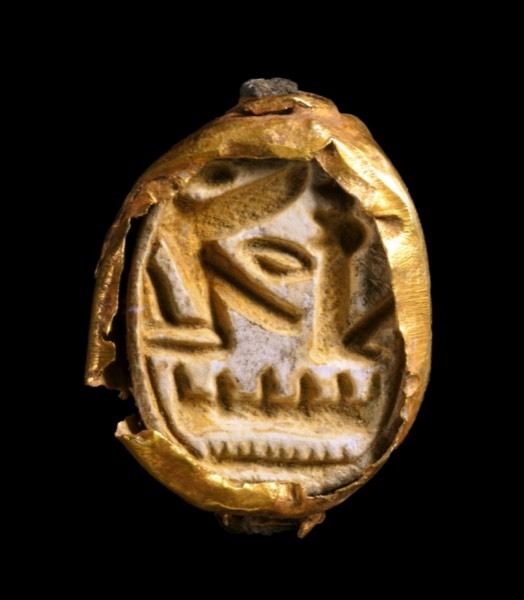 A rare artifact that was found next to the skeleton is an Egyptian scarab seal, encased in gold and affixed to a ring. The scarab was used to seal documents and objects. The name of the crown of Pharaoh Seti I, who ruled ancient Egypt in the thirteenth century BCE, appears on the seal. Seti I was the father of Ramses II, identified by some scholars as the pharaoh mentioned in the biblical story of the Israelites’ exodus from Egypt. Already in the first year of his reign (1294 BCE) a revolt broke out against Seti I in the Bet Shean Valley. Seti conquered that region and established Egyptian rule in Canaan. Seti’s name on the seal symbolizes power and protection, or the strength of the god Ra – the Sun God – one of the most important deities in the Egyptian pantheon. The winged Uraeus (cobra), protector of the pharaoh’s name or of the sovereign himself, is clearly visible on the seal. The reference to the pharaoh Seti on the scarab found in the coffin aided the archaeologists in dating the time of the burial to the thirteenth century BCE – similar to the burials that were exposed at Deir el-Balah and Bet She‘an, which were Egyptian administrative centers. A cemetery dating to the reign of Seti 1 was previously discovered at Bet Shean, the center of the Egyptian rule in the Land of Israel, and similar clay coffins were exposed. Evidence of an Egyptian presence was detected in archaeological surveys conducted in the Jezreel Valley in the past but the discovery of the impressive anthropoid at Tel Shadud surprised the archaeologists. Tel Shadud preserves the biblical name ‘Sarid’ and the mound is often referred to as Tel Sarid. The tell is situated in the northern part of the Jezreel Valley, close to Kibbutz Sarid. The city is mentioned in the Bible in the context of the settlement of the Tribes of Israel. Sarid was included in the territory of the tribe of Zebulun and became a border city, as written in the Book of Joshua: “The third lot came up for the tribe of Zebulun, according to its families. And the territory of its inheritance reached as far as Sarid…” (Joshua 19:10). Tel Shadud is strategically and economically significant because of its location alongside important roads from the biblical period.